A college golfer's use of a rangefinder is limited to measuring distance, making a caddie's advice valuable. 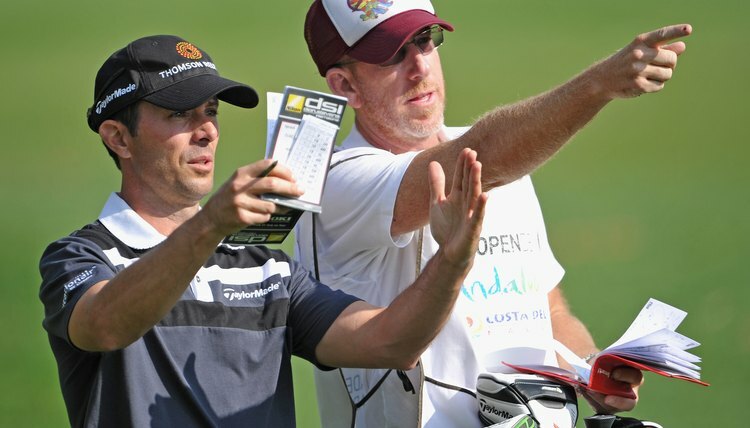 Although golf is often slow to embrace new technology, rangefinders -- instruments that use laser or GPS technology to measure distance -- have been given a stamp of approval by the United States Golf Association. However, the approval is limited to measuring distance, and rangefinders that offer additional information to players are illegal. Accordingly, the NCAA, which regulates college golf and follows USGA rules, has embraced the limited use of rangefinders in its competitions. So, college golfers no longer have to pace off yardage from 150-yard markers, but they still have to toss blades of grass into the air to determine wind direction. USGA Rule 14-3, which regulates "Artificial Devices, Unusual Equipment and Unusual Use of Equipment," banned the use of rangefinders and other devices until 2006. The rule stated that players could not use any devices or equipment "for the purpose of gauging or measuring distance or conditions that might affect his play." the USGA revised Rule 14-3 in 2006 to permit use of rangefinders under the local rules of a golf course or golf association. The revision appeared to allow all rangefinders, even those that supplied more information than distance from the pin. Soon thereafter, the USGA issued a clarification to the revision. The clarification stated that "golfers must not use distance measuring devices for handicapping purposes or in competition that are capable of gauging or measuring other conditions that might affect play even if such a function is not used." Allowing the use of rangefinders to pinpoint distances on a course was a logical extension of the other playing aids allowed by the USGA, including yard markers, yardage books and caddies. In addition, the use of rangefinders seemed to speed up the pace of play -- players didn't need to walk off distances every hole -- which is desired by all golf organizations. However, using rangefinders to provide information about the terrain, elevation, wind direction and wind speed is not allowed, meaning a college golfer must determine those aspects on his own. The 2011 NCAA golf championship rules for men and women stated, in bold letters, "Rangefinders that measure distance only may be used during practice and competitive rounds." The operative word is "only." Rangefinders that offer functions in addition to distance measurement are illegal, even if a player disables the other functions. A player using such a device in practice rounds or competitions will be disqualified, so it is advisable to make sure any rangefinder complies with USGA and NCAA regulations by measuring distance only. Cybergolf: Are Rangefinders Worth It? What Are Golf Fairway Markers? What Is the Leaderboard in Golf?